To start off I wanted to show you this fun display I made with the Cricut Artbooking cartridge. 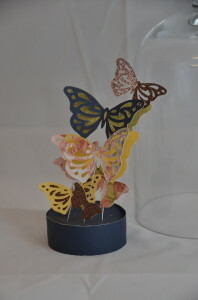 I cut the butterflies using various sizes and put them on floral wire. 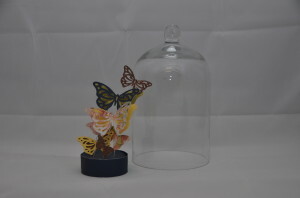 I took some floral foam and covered it with cardstock using liquid glass. 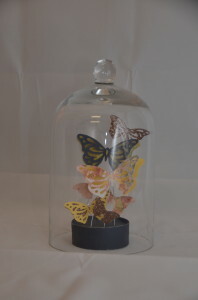 I put the wire into the base and then secured my butterflies in various places. I wanted to make a bigger display but this was the biggest bell jar I could find at Michael’s. If I ever come across a bigger one I will definitely upgrade this project. It was super easy but has such wow-factor!